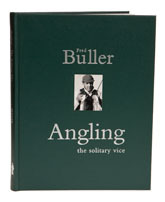 It is difficult to be objective about a book by someone who is one of angling’s icons, but fortunately Fred’s latest work lives up to expectations, although it is by no means in the first rank of his quite considerable output. In sixty years of angling, Fred has been to most places and caught most sorts of fish and darts from one fascinating tale to another, spiced up with stories of anglers that the rest of us can only dream about. Several of the stories here have been published before, but it is unlikely that the majority of people will have come across them, as they are extracted from some fairly specialised magazines and it is good to see them presented to a broader audience. If I had to describe the book, the nearest I could get to it is to say it is like a modern version of Courtney Williams’ Angling Diversions (and if you have never read that one, then you will have to add it to your list). There are some absolutely classic tales in here, such as the one about Churchill, who, Fred relates, “…so far as we know, never fished, but he did shoot a pike that was subsequently set up and cased. The brass plaque was engraved: ‘This pike was shot by Winston Churchill in the moat in 1907.’” The case was hung in the gents toilets at Salisbury Hall, where, Fred tells us, it subsequently gave de Havilland’s design team the idea for the streamlined shape of the Mosquito bomber. Quite frankly, if you will swallow that one, you will believe anything, so I shan’t repeat any of the more unlikely stories found within these pages.